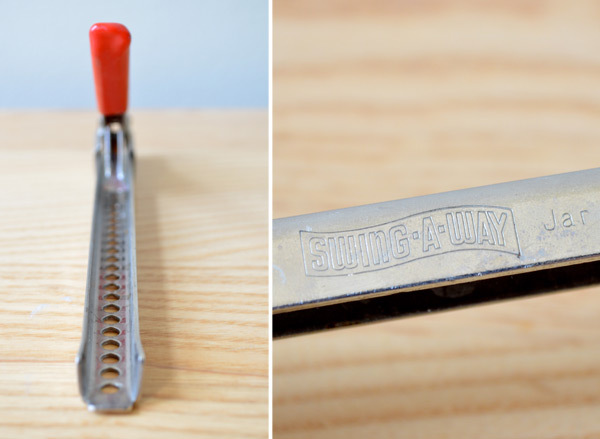 This past weekend I thrifted this vintage jar opener, mostly because it had a red handle (meaning it goes with the kitchen decor), but also because I was curious to see if it really worked. I know this will sound girly, but I frequently ask the "Honey, can you open this?" question when I'm cooking away in the kitchen (I blame the years of working on a computer for weakening my hands). True to most companies that are more than 50 years old, it has no website, no Facebook page, no Twitter, nothing to give you a glimpse into its history; the only thing I could find online was this newspaper article by Cheryl Wittenauer of The Associated Press, written for the Southeast Missourian in 2005. > The company started back in the late 1930s by Idus Rhodes, whose first product was the Kriss-Kross blade sharpener for men's razors (the product was shoved out of the market once disposable blades were invented). 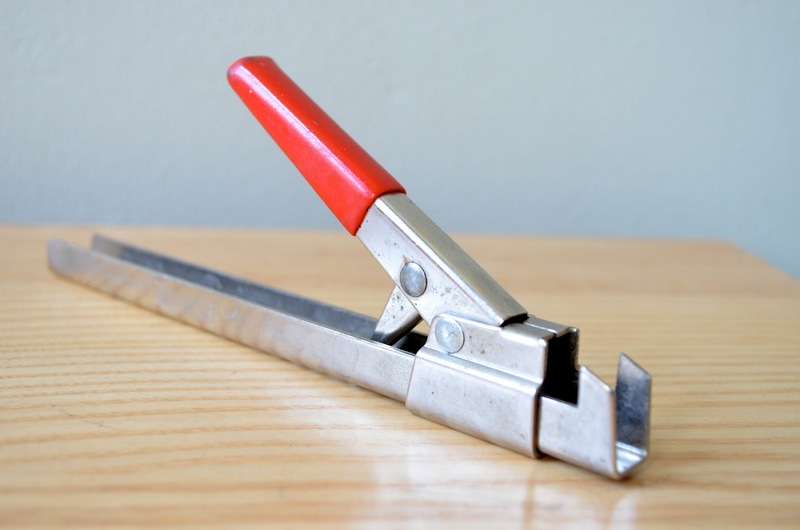 > Swing-A-Way's original product was a wall-mounted can opener. > We can all thank this company for the "gear-driven cutting wheel" we now use to open cans. Swing-A-Way brought this idea into its products in 1945, thus "revolutionizing" the industry. > In the 1950s, it introduced its first handheld can opener. > The company went on to produce ice crushers, jar and bottle openers, seafood and nut crackers, peelers, ice cream scoops and a corkscrews. > Swing-A-Way is probably the best-known brand for openers in the culinary/domestic kitchen world, and as such it is still going strong in today's economy.